I tried to get into Flash a few years ago, with its New 52 incarnation, and it didn’t grab me — but the itch remained. This week I sampled a Geoff Johns issue, then a Rebirth issue, then a couple issues of Flashpoint — and with every one, I became both more intrigued and more confused. But I homed in one one villain, Reverse-Flash, who sounded like something I hadn’t seen in a superhero comic before: a time-travelling mirror of the Flash, who uses his speedster power to destroy Flash’s life from the future. So cool! I love time travel, superheroes, and creative exploration of the possibilities of superpowers; combine all three, and you have my interest. 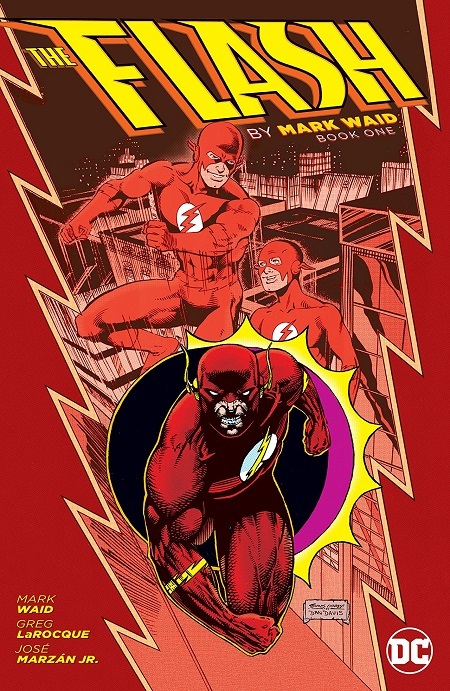 I went down that rabbit hole, eventually reaching this excellent Comics Alliance guide to the character, eras, and best runs of the Flash, and came out with a consensus on where to start: Mark Waid‘s 100-plus issue run on the title (followed by the Geoff Johns run, and then on to Morrison and Millar, Rebirth, and New 52). I deeply enjoy falling in love with a new-to-me superhero/superteam, and in recent years I’ve had a fantastic experience doing just that with hundreds of issues of Fantastic Four, Green Lantern (the topic of one of the most popular posts on Yore, Green Lantern trade reading order: Geoff Johns’ run and all concurrent Lantern TPBs), Deadpool, and Swamp Thing; all signs point to the Flash being just as rewarding. The Flash, perhaps more than any other character in DC Comics’ stable, represents the strength of the legacy hero: the passing of the mantle from mentor to protege, with each successive version having their own strengths and weaknesses. Let me be clear: if you buy only from one section of this Flash comics list, make this that section. Waid’s Flash is the best Flash, period. That bit was what really sealed the deal. Last night I got a few issues into Waid’s run, and it’s amazing. It opens with an overview of the three Flashes, and then a history of the then-current flash, Wally West — and that sounds like a lot of exposition, but it’s deftly and beautifully done (and perfect for a newcomer). Like Green Lantern: Secret Origin or the start of John Byrne‘s run on Fantastic Four, Waid’s Book One TPB tantalizes while guiding me through enough Flash background to get my feet under me; there are references I don’t yet get, but which I’m sure a longtime fan would know well — but they’re revealed and paced perfectly. It feels like a perfect on-ramp. Waid’s run entire run isn’t collected into TPBs yet, but the first three books are. Book One is where I started, and now that I’m strapped in I can’t wait to see what the rest of the ride is like! Yes, Rebirth and Flashpoint are also Geoff Johns runs; I was bouncing around looking for recent comics as possible starting points, and he’s done a lot of them! I’m confident I’ve grossly oversimplified Reverse-Flash here, but I’ve been trying to avoid spoilers before getting to see him in the comic.